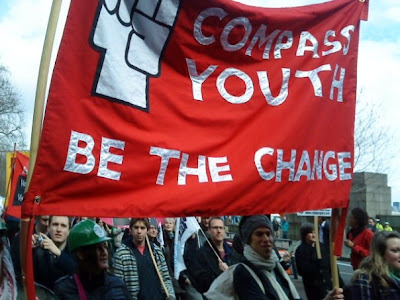 Last week, on this site and on our email list, Compass Youth asked for some questions that you'd like to ask three candidates for Labour Party NEC youth rep. They've all responded. Candidates responses have not been edited by Compass Youth and, obviously, do not necessarily reflect our views. 1. All three candidates have talked about the democratisation of Labour’s youth movement, how would you go about doing this? Daniel Carden: I believe there is only one fair and accepted system of electing representatives in any democratic organisation: One Member One Vote. The current system of having our representatives elected by a delegation of those who happen to attend the right meetings is something I am committed to changing. I want the NEC Youth Representative, as well as the three senior Labour Student officer holders and senior members of the Young Labour Committee to be elected by a ballot of their organisations’ members. The most feasible and cost-effective way would probably be to utilise technology and the internet for such elections, in conjunction with organised hustings around the country. If elected to the NEC I will work with young members and other NEC members to look at how best to make this change. Stephanie Peacock: Young Labour urgently needs to change so that it’s more open, representative and democratic. That’s the clear message I’ve got from young members I’ve spoken to up and down the country over the last few months. Addressing this democratic deficit in Young Labour will be one of my top priorities if elected to the NEC and the starting point should be Young Labour National Committee. We need to look at how the composition of YLNC should change and how YLNC can work better so that members know who is on it, how they got there and what they do. Most of all we need to ensure that the officers of Young Labour are elected by the wider membership rather than simply by members of YLNC itself. It’s not for me as one member of Young Labour to impose my version of reform on Young Labour – that would be equally undemocratic. The problems are clear for all to see, but the solutions are more complex and they need to be discussed by the membership. For instance, if we move to a ‘one member, one vote’ system for the NEC election, as some have suggested, how do we ensure that the trade unions and affiliates still have a say? How do we ensure that all regions are fairly represented on YLNC? All these questions and more need to be answered. That’s why I want all young members to be consulted before pushing forward rule changes through the party structures. Cat Smith: No single step will be enough to democratise Young Labour, nor should we pretend that it is only lack of opportunities for democratic involvement that hold back activity within YL. I was proud to back the rule change submitted by young members in my CLP that would have let the upcoming conference elect the Executive Committee. As a start of a process and not the end of it, I would push for this proposal, ruled out by the Conference Arrangements Committee, to be as widely supported as possible. We must then consult on the way forward after that. 2. What will you do to make sure internal Labour Party elections, such as that for NEC Youth Rep, are fair? Daniel Carden: Having been a candidate this time around I have learnt a lot about the difficulties in standing for such an important position. For example, I have been criticised for not being a loud enough candidate in this election and not making contact with enough members. But this has been made incredibly difficult as when I have tried to obtain CLP, Young Labour and Labour Student contact lists, Labour Party HQ has not been able to provide them for me, whilst another candidate seems to have obtained these lists. With first hand experience of such problems I would make it a top priority to establish clear and fairer procedures for these elections. Stephanie Peacock: The rules are there to make sure all internal elections are fair. They are important and they need to be enforced. As far as I’m aware it’s one of the NEC’s roles to enforce party rules, so as an individual member of the NEC I would play my part in ensuring that happens. Cat Smith: Openness and greater involvement is the key to breaking with the culture of control that some try and impose both on delegates and on the process itself within Young Labour. The lack of readily available information on this election has been a disgrace. What appeared to be an official Young Labour communication was used to lobby for an NEC slate has to be seen as a particular low point. 3. Do you see any problem with the chair of the Young Labour National Committee being elected behind closed doors, by a committee only elected partially by young members as a whole? Daniel Carden: What amazes me most of all is that I have never met a member of Young Labour who believes the current system is adequate – so why haven’t we changed it? It is simply unacceptable for the current system to continue, if I am elected I will make it my top priority to sort this issue out. Stephanie Peacock: Yes and that’s why, as part of the reform of Young Labour to make it more open, representative and democratic, I’d like to see the Chair of YLNC elected by the wider membership. Cat Smith: Yes, greatly. Most young activists I speak to are surprised to hear that such a position exists – an open election would give potential chairs a platform to raise debate in the wider party and movement. I would support all executive officers being elected at the youth conference using the current voting distribution which ensures strong union representation. The issue of other YL National Committee members not being elected by young members (such as regional NPF youth reps) must be looked at more broadly, perhaps with online voting playing a role. This is obviously a much broader issue than simply the makeup of the committee though. 4. How – if it at all – would you change the composition of the Young Labour National committee and the way it is elected? Stephanie Peacock: At the moment very few people know who is on YLNC or what they’re supposed to do. That needs to change. As I’ve said above, I think the officers should be elected by the wider membership rather than simply by members of YLNC. A consultation on reform of Young Labour must also look at the composition of the rest of the committee. Any change must ensure that all regions are equally represented, that there is some gender balance and that the trade unions are fully engaged and represented too. 5. Will you promise that a proposal for a new democratic structure of Young Labour will go to the full NEC in time to be tabled as an NEC proposed rule change at Annual Conference 2007? If not, why not? Daniel Carden: Yes, yes and yes! I fully commit to internal party democracy, and I am the only candidate who has put this at the heart of their campaign. Stephanie Peacock: I’ve pledged to deliver reform of Young Labour before we meet for the next Youth Conference. To do this properly I want to consult members about the future of Young Labour, but I think it would be a distraction to start a consultation of young members before the Scottish, Welsh and local elections are out of the way. Unfortunately, I don’t know what the deadlines for submitting rule changes to the NEC and annual conference are. If this can be all done and dusted in time to go to this year’s Conference then all the better, but I can’t promise that it will be. Cat Smith: Yes. CLPs and affiliates can also submit changes until the 8th of June, though due to an outdated convention from the 60s, these will only be discussed at the conference after next. 6. In light of the party’s financial problems, how would you defend the employment of three full time sabbaticals officers for Labour Students, based at Party HQ? Daniel Carden: The issue of funding for our youth movement and those working on behalf of it will have to be examined. Maintaining support amongst young people is essential for the future of the Labour Party and I will push for further funding and resources and ensure it is used efficiently. The current situation with Labour Students having three full-time staff and Young Labour no longer even having its one Youth Officer cannot continue. This issue is a complicated one but what most of us can agree on is that it needs to be tackled sooner rather than later, and tackled with a fair agreement between Labour Students, the party and Young Labour. Stephanie Peacock: I will always defend having three Labour Students sabbatical officers. Their three small sabbatical salaries are a very small price to pay as, from my experience, they work incredibly hard and offer very good value for money to the Labour movement. The work they do to recruit members, ensure Labour has a presence on campus and organise campaigning in marginal seats is absolutely critical to the future of our movement. If finances are so bad that the Labour Party is looking for even more cutbacks, then they should look elsewhere. Similarly, we cannot keep cutting staff in the regions and not expect to pay the price at election time. We have wasted too much money on billboards, gimmicks and glossy leaflets which are poor value for money compared to the cost of employing organisers in key seats and ensuring that voters are communicated with on the ground all year round. Cat Smith: Labour Students is in the highly anomalous position of being an independent affiliate to the party but with its staffing and other costs provided out of central funds. The party must use its limited resources in the most efficient way possible and I don’t think we in Labour Students should be immune from that. That said, the party must see youth and student work as a total priority – the party is aging and will literally not exist on the ground if young people are not engaged. As an independent affiliate Labour Students has the ability to approach trade unions and others to seek specific funding, something not possible in other areas of the party’s work. 7. As Party finances are so bad, it is likely that there will be no provision available for a full time Youth Officer role. Do you agree that Young Labour should be made autonomous of the Labour Party, like Labour Students so that organisation and fundraising can be done separately? Daniel Carden: No. One of the reasons Young Labour does work so effectively in some areas is that its membership of the organisation comes through membership of the Party. This means that if the organisational power is there, young members of the Labour Party can work together in their areas or regions. However, the real problems are often with obtaining membership lists and being able to create a good communication system between the Executive and the membership. I will work to assist Young Labour groups with these problems on the ground, in addition to creating a national Young Labour website covering each group across the country. Stephanie Peacock: Although I understand party finances are in very bad shape, I don’t accept that we cannot get a full time Youth Officer once again. I think it’s essential to the future of the party that we have at least one member of staff who can work on the recruitment and development of young members and support Young Labour groups in the nations and regions. As with the Labour Students sabbatical officers, I think this post is very good value for money and essential to the future of our movement. Trade unions have sponsored this position in the past and I’m determined to explore every possible option to ensure that we get a Youth Officer once again. I think Young Labour should have a stronger say on policy and greater scope to campaign within the party on issues like the youth rates of the minimum wage, but I’m not sure creating a separate organisation would help. Cat Smith:I agree that we are unlikely to see a full time Youth Officer any time soon, but I am not convinced that becoming an affiliate is the correct answer. Doing so would mean the party need not give us even the limited amount of support we currently receive, and is unlikely to second a staff organiser to the affiliate if funds become available in the future. 8. What experience do you have of running a Young Labour group that could help you support & develop Young Labour groups in other parts of the country? Daniel Carden: I am the Transport and General Workers’ Union’s Youth Officer for the Parliamentary branch and I am the treasurer for the LSE Labour Club. My experience in these organisations has come through having to persuade and recruit young people. I have never sort to hold a position for the sake of it, and I have worked hard to put all my time and energy into two organisations that I care greatly about. Anyone who looks at what the LSE Labour Club has been up to this year, in terms of events and campaigns will see a dramatic change from the years gone by. We’ve had meetings with Peter Hain MP, Alan Milburn MP, Neil Lawson, Hilary Benn MP and Hazel Blears MP, with real concrete policy discussions which we presented to these figures. In the TGWU I have much more of a responsibility to work with young members on our agenda for improving workers’ rights and how we go about such campaigns. I have also maintained a good relationship with London Young Labour by linking up LSE events and campaigns with their executive. Stephanie Peacock: I was Chair of West Midlands Young Labour for two years while I was at college, helping to build up an active Young Labour group and getting members involved. During those two years, I organised regular social events and policy discussions where Ministers came to hear what members had to say. We campaigned in key seats across the West Midlands and, working with the T&G in our region, took minibuses of young members to campaign in the Hodge Hill, Hartlepool and Blaenau Gwent by-elections. I also sent regular reports to young members to keep them in touch with the work me and the Committee were doing. I want to use this experience to help young members in other parts of the country so that we can set up and develop an active Young Labour group in every nation and region. Getting a National Youth Officer is essential as young members and Young Labour groups need greater support and resources. Cat Smith: Lacking a group in our largely rural area I’d use my general organising experience gained from time spent organising Lancaster University Labour Club and arguing for and drawing in wider support for Labour policies on the student union council and in NUS. 9. How will you keep us up to date with your work on the NEC? Daniel Carden: I admire the work that other NEC members such as Ann Black and Angela Eagle do on the NEC in providing reports of each meeting and their contributions. I will work in the same way to provide full written reports posted on my website available for any comments and criticisms members would like to provide. Stephanie Peacock: I was the first candidate in this election to have a website and if I’m elected I intend to keep the website as a way of communicating with members. I would also like to send out reports to all young members after every NEC meeting, in the same way that I have sent regular reports to members in the West Midlands. But it’s important that communication is not just one-way. During this campaign I’ve been to events around the country – in Glasgow, Edinburgh, Cardiff, Burnley, London and Stoke-on-Trent – listening to young members about what needs to change. If elected, I will continue to listen to young members so that I can be sure to represent their views. Cat Smith: I will blog reports similar to those compiled by NEC member Ann Black (www.annblack.com) so that all young members can scrutinise and comment on my actions. I will publicise the site containing these reports in electronic mailings to all young members as well as to TU youth sections and Labour Clubs. 10. No other issue has driven so many young people away from the Labour Party as the Iraq war. What is your position on the war? Daniel Carden: Mistakes have been made and we must own up to and criticise a policy that has not delivered on the ground for ordinary working-class Iraqis. But what we must remember, above all, is who our comrades are – we must support the Iraqi TUC and applaud British trade unions and our Labour party for working hard to help people with our values of democracy, socialism and equality in Iraq. I have supported Labour Friends of Iraq in their work, including trying to prevent a continuation of the appalling treatment of Iraqi workers and trade unionists that remains in the country. Stephanie Peacock: Like many young people I was very sceptical about the need for military action and could not support it without a second UN resolution. The appalling lack of planning for the reconstruction of Iraq has made things even worse and the scenes we have seen on our TV screens over the last few years have been appalling. We’ve got to learn lessons from the Iraq fiasco and I think the Government has a huge job of work to regain the trust of young people who have been turned away from the Labour Party because of this. Cat Smith: This is clearly the biggest vote-losing policy the government has pursued since it was first elected. With our party’s rich history of struggling for progressive change, to see the largest demonstration in the country’s history marching against a Labour government, and the PLP so split down the middle that the government had to ally with the Tories was a disgrace. I am now increasingly concerned by reports that new long term contracts will allow western oil companies to siphon off Iraq’s oil revenues for many years to come. It is with that in mind that I agree with General Dannatt’s view that UK troops contribute to the problems in Iraq and we should be withdrawing from the country. 11. Do you support a higher minimum wage without exemptions for young people? Please explain your position. Daniel Carden: The disparity of the minimum wage which is based on age is simply unacceptable. The lowest rate, for 16 and 17 years olds, and the middle rate, for 18 to 21 years olds, disadvantages some of the most vulnerable young workers, predominantly in working class areas where a greater number leave school at the ages of 16 or 18. The Labour Party’s values of equality – with legislation such as that on age discrimination – takes a shot in the face by such glaring unfairness for young workers. Stephanie Peacock: Yes. The minimum wage is one of Labour’s achievements that I’m most proud of. It’s shocking to think that ten years ago workers would often be paid as little as £1 or £2 an hour and this blatant exploitation would be fully within the law. But despite the progress we have made, low pay still exists and young workers are unfairly discriminated against. As I said on my website a few weeks ago, we need to end age discrimination in the minimum wage and give the same level of protection to all workers, no matter how old or young they are. Usdaw, Unison and Compass Youth have been campaigning on this very issue and it’s exactly the sort of thing Young Labour and Labour Students should be making a noise about. Cat Smith: I completely oppose exemptions for young people. What this effectively means is young people doing exactly the same work as an older person can be paid less. Clearly anyone who believes in equality would oppose this. And yes certainly the minimum wage should be higher. The Tory arguments that a national minimum wage would cause areas of unemployment were proved wrong so we need to defeat those arguments that say raising it would do the same. Having won the principle of a ‘safety net’ we should look seriously at establishing a living wage – the argument is being won in London so lets raise it nationally. 12. Will you campaign to abolish student tuition fees? Please explain your position. Daniel Carden: If we’re forced to go down the route of tuition fees by the central party, then the current system is still not means tested enough. Actually, I’d quite happily see the upper-end of the fees scale go up for students whose parents earned over £100,000 per year, and use that money to lower fees and extend grants for ordinary working-class students. It would be genuinely redistributive, and more likely than the abolition of tuition fees, however much we may wish for this. Stephanie Peacock: I supported the Higher Education Bill three years ago because I wanted to see an end to up-front tuition fees and the introduction of grants and bursaries for poorer students. Having now been through the system myself and seen many of my friends apply to university, I can see how top-up fees are putting people off from going into higher education. If people are being put off and we can’t fulfil our targets to widen access, then the Government should not be afraid of looking again at this policy and the impact it’s having. The most important debate now is about whether we should lift the cap on top-up fees in 2010. I hope a Labour government wouldn’t do this, but I fear a Tory government might. Lifting the cap really would unleash a market in higher education, I’m totally against this and that’s why I went on the NUS demo last year. I’m proud that Labour Students in NUS are a leading part of this campaign. When you read that university vice-chancellors want fees of up to £10,000, the need for the student movement to unite on this issue becomes even more urgent. Cat Smith: The introduction of top-up fees was a major error; backtracking on a manifesto commitment, ignoring Labour Students opposition and that of the trade unions to the policy and causing another PLP rebellion that almost defeated the government. The system wasn’t working but I believe that is because all tuition fees are wrong. Student debt and young people’ perception of it means there is not a level playing field. Transferring the cost onto individuals and forcing prospective students, many who are only 16 or 17, to consider taking on such enormous debts clearly means many will feel unwilling to apply. We must use the growing evidence that backs our case to win the argument in the Labour Party and turn this policy around. 13. Which leadership candidate will you back and why? Daniel Carden: Gordon Brown looks the only likely leadership candidate to take on the Tories and win. However, it is not good enough for members to simply offer their support to candidates before a genuine policy direction has been put down. It is our job to make our voices heard by leadership and deputy leadership candidates and make sure our concerns, and the concerns of the general public, are listened to. Stephanie Peacock: The forthcoming leadership and deputy leadership elections are a great opportunity for young members to have their say and demand a firm commitment to the youth & student movement from all the candidates. That’s why, if I’m elected, I want to organise hustings for young members so that we can hear from and question all the candidates. I’m really looking forward to the debates, but if it came to a choice between Gordon Brown and John McDonnell (as it looks like it will be) then I’d vote for Gordon Brown. In his passion for tackling poverty, both in this country and around the world, he’s shown that he is deeply committed to Labour values of equality and social justice. Cat Smith: I am backing John McDonnell’s candidacy. It is incredibly important that the membership has a choice – the last time we did, I was still in primary school! John is standing on a platform that includes the issues that probably brought the majority of us into the party – an end to wages insufficient to live on, the defence of trade union rights and opposition to privatisation of public services. These, and the future direction of British foreign policy and our relationship to the US must be included in the debate over the leadership. We cannot ignore the elephants in the room. 14. Which deputy leadership candidate will you back and why? Daniel Carden: I have an idea of which candidates I prefer but with so many people putting themselves forward I have not committed myself to anyone. For me, I want to hear who will represent real party members and their views to the leadership. When members cannot elect the Chair of the Labour Party, the position of deputy leader has an important role in bridging the divide between party and government. Stephanie Peacock: While the leadership election is an opportunity to renew the Government, I think the deputy leadership election ought to help renew our party organisation too. I haven’t completely made my mind up because I think there may be other candidates to declare. Jon Cruddas has said some very interesting things about how, after years of declining membership, we urgently need to renew our party and re-engage with our grassroots. I’ve also been impressed by Alan Johnson’s very firm stance on gay adoption and I am impressed with the work Hazel Blears has done as Party Chair and she would certainly create more of a balance at the top of the Party. There are factors that draw me towards multiple candidates but I am yet to make a firm decision. The Party has taken great strides forward with the representation of women in parliament and I would like to see this followed through into the leadership, but clearly that is not the main basis for a decision. Candidates such as Jon Cruddas are capable of talking about listening to the party and not sounding laughably hypocritical given their previous track record. Cat Smith all the way! Cat Smith by a long, long way. The only candidate to talk real sense on the Iraq debacle, the only one with the guts to talk straight about the betrayal of top-up fees and the only one to back the only true left candidate in our leadership race, John McDonnell. Cat seems like the only candidate who can mix the widest range of experience with principles and prudent policy. I was proud to nominate her to Sheffield Labour Club, and happy to see both Labour Clubs and Unison back her. Well, if Stephanie Peacock wishes to ensure the rules for all elections are fair, then surely she should not have accepted the very generous help from various staff officials and other groups who are meant to be neutral in this, in the party that's been given to her - far more help than has been given to other candidates. I am not fooled a bit by Stephanie Peacock, but I suspect others are, sadly, and even those that choose not to be fooled are only doing this for their own ends. This sort of carry on is what unfortunately characterises youth politics and gives it a bad name. in short, it is a privileged and favoured few who always benefit from gaining positinos of power, then doing exactly what their masters say. The danger is they carry these antics into the wider movement all too often. I'm saying all this here, as there is no other intelligible forum to say it on that anyone will read. Stephanie Peacock is so clearly the leadership backed candidate in this election, and it is clear for all intelligent observers to see it. I think that needs stating, not least because of the dubious answers to the questions from her to the questions put on this forum. I think they were a bit too textbook and professional for my liking. Typed by someone at HQ or her regional office perhaps? Of course Stephanie will almost certainly win the day, I have no doubt of that, not least because she is literally and amusingly "busing them in" from Birmingham on the day, but don't expect my support now or at any time in the future. The Team Peacock's antics will not be forgotten by me and many others, I assure you, and all I can say is if she ever comes sniffing round my ward or constituency looknig for a seat in the future, I shall have something very public to say about it! How do you know about all these things that go on then? Methinks that 'Cllr' Kris Brown is getting a bit paranoid in his old age. How old are you now Kris? 74? Also, what 'council business' have you got on this week Kris? What a strange point to make. Suppose 21 is getting on a bit but wouldn't like to be considered old. In terms of Council business this week, (starting 18th Feb) I suppose Full Council is the biggest I have in my diary as we will be voting on the Budget plus I've got a motion put down. Visit enfield.gov.uk for more info. For people who are part of tertiary education it becomes obvious that any overview requires passing judgment upon relevant data. If you need someone who would make logical structure in research paper help from Allfreepapers.blogspot.com on time for your university instructor come to our online service. It hires only qualified men with good skills and bright brains aware of many serious scientific features of any kind of problem of a modern life.